law similar to this effort had been considered in Germany last spring without success. They report that the key difference between the EU directive and the German law is "the reporting obligations under the proposed IT Security Law go further than those in the NIS Directive and the German proposal contains additional obligations in particular for telecommunications providers and providers of commercial information society services." 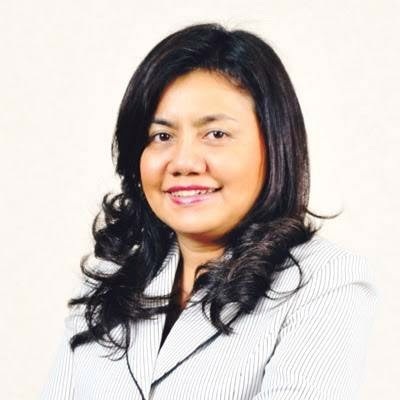 Improved IT security of companies: in particular, providers of critical infrastructures will be required to implement and maintain appropriate minimum organizational and technical security standards in order to ensure the proper operation and permanent availability of those infrastructures and to report significant IT security incidents. Protecting citizens online: Increased security standards but also additional information obligations vis-à-vis users/subscribers. Strengthening the Federal Office for Information Security (“BSI”): The BSI shall act as the national information security authority and centralized information hub with regard to any sort of cyber-attack or other impairment of information systems of critical infrastructures. For this purpose, the BSI will collect and analyze essential information in relation to IT security and to inform operators of critical infrastructures and competent authorities but can also provide information about providers’ compliance with security requirements and security incidents and liaise with third parties (such as providers) to identify and warn affected users. The BSI will publish technical guidelines on security measures. Among other things, the BSI will be empowered to (i) investigate IT products, systems and services and to disclose and publish its evaluation of the security of the investigated products, systems and services; (ii) request from the providers of critical infrastructures a copy of audit and certification results prepared to prove compliance; (iii) request immediate removal of security defects. Expanding the competences of the Federal Criminal Police Office (BKA): the BKA will become competent for police tasks regarding the prosecution of cybercrimes insofar as they are directed against the security of Germany or certain vital facilities. Protecting the IT security of the German Government and federal administration: the BSI will obtain the power to issue mandatory requirements for the IT of the federal state. The Government must approve the measure before it is sent to the parliament for approval. To read more detail about the law -- its scope, its requirements for those in the private sector, among other things -- check out InsidePrivacy's detailed analysis. Facebook is again making privacy headlines. Sources have discovered that Facebook's new Messenger app has a laughably invasive list of terms and conditions to which users must agree. What is worse is that this app replaces messaging services offered within the main Facebook app, trying to force millions of users to agree to terms no one should have agree to. Read your phone’s call log. By contrast, services like our SumRando Messenger are security-focused and privacy-protecting while still being easy to use and convenient on the go. 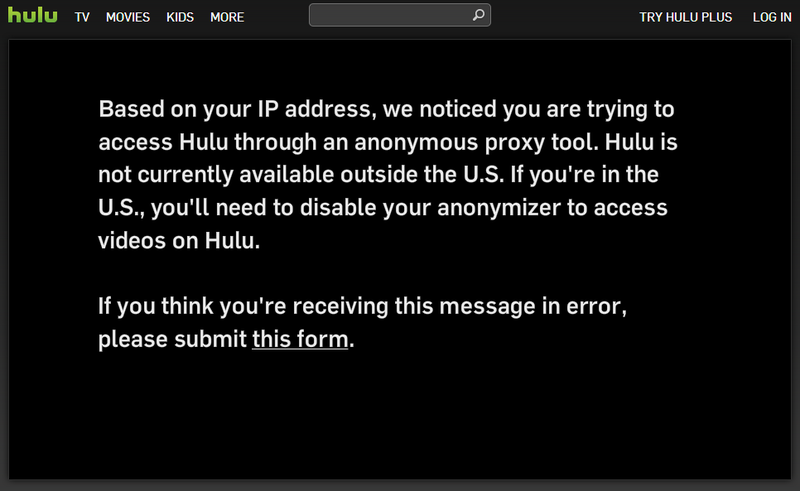 We have gone out of our way to design an app that protects users and those they message while other services continue to force unfair terms on their users. Messages automatically deleted upon logout with only 10 messages stored (if you do not clear you conversation) stored for future conversational reference. See the difference? We don't believe consumers should have to choose between privacy and convenience. What remains striking is just how many major developers try to force consumers to make that choice. The benefit of a story like this about Facebook Messenger is that it is a story that could attract millions of Facebook users to take privacy concerns seriously. One of the largest social media and messaging companies in the world has taken a stand against privacy, and their users are retaliating. What remains to be seen are two things: How many users will refuse this new Messenger app and what Facebook will do (if anything) to bring them back into the fold. A study conducted by Princeton University and Belgium’s KU Leuven University revealed that more than 5,000 of the top websites in the world have been testing "canvas fingerprint" technology intended to replace cookies, to track user data with most using popular widget AddThis. "An invisible image was sent to the browser, which rendered it and sent data back to the server. That data can then be used to create a 'fingerprint' of the computer, which could be useful for identifying the computer and serving targeted advertisements." 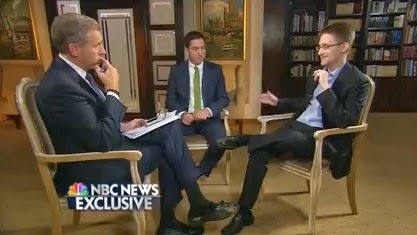 AddThis Chief Executive Rich Harris accounted for their testing by saying they were seeking a "cookie alternative." According to ProPublica, Harris "considered the privacy implications of canvas fingerprinting before launching the test, but decided 'this is well within the rules and regulations and laws and policies that we have.'" Cookies have been around since the 1990s, and many internet users have routinely started to circumvent their influence. Canvas fingerprints signaled the potential to track users' history in more covert ways, and AddThis appears to have tested their efficacy on thousands of sites, including WhiteHouse.gov and YouPorn. 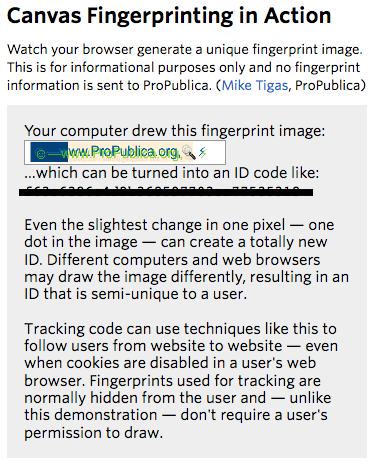 ProPublica explains, "[Canvas] fingerprints are unusually hard to block: They can’t be prevented by using standard Web browser privacy settings or using anti-tracking tools such as AdBlock Plus." You can test the canvas fingerprint technology yourself on ProPublica, to see what kind of image you produce to be translated into a unique ID number with the Canvas Fingerprinting in Action feature. 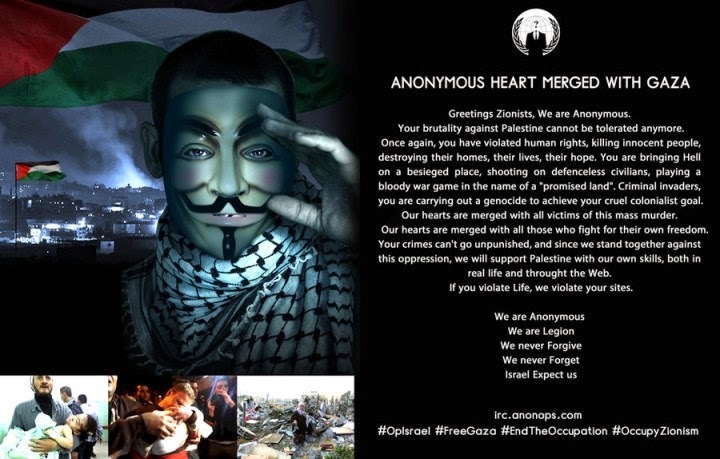 Related to our previous post, hacker group Anonymous claimed to have taken down thousands of Israeli websites between July 11 and July 17 in support of the Palestinians, according to the International Business Times. Today, Businessweek reports the group has claimed responsibility for hacking a top Kenyan military Twitter account, where they "called for retribution over the war in Gaza, Kenyan politicians to stand down and an end to tribalism." To read more about Anonymous's involvement, you can follow their website. If there's one easy thing for people to understand about cybersecurity and cyber warfare, it's that there is a usually a strong presence of cyber attacks when there are threats of or actions of more traditional warfare. While cyber warfare produces tangible technological, organizational, and economic damages, it can also be used as a form a psychological warfare. A recent example comes out of escalated tensions in the Gaza Strip, where Hamas has used technology in service of their objective aims and Israelis have responded defensively. Bloomberg reports that cyber attacks related to escalated tensions in the Gaza Strip have risen tenfold in the last few weeks. Israeli hackers didn’t stand idly by. They left some Hamas websites disabled for hours and others displaying content maligning the Islamist group and its leaders. An Israeli response to Hamas attack on the Domino's Facebook page translates as "“You can’t defeat the Israeli hunger for pizza!" according to Bloomberg. 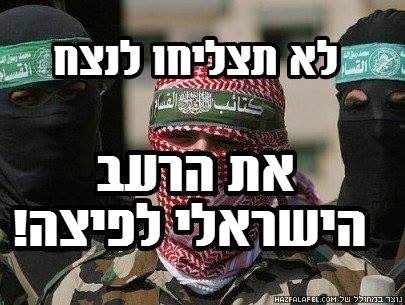 Some in Israel suggest that Hamas is also slowing internet service in addition to internet hacking and defacement like that which is being attributed to them in accounts like the above. In forging a response, Israel cannot simply shut down access since their opposition generally do not use Israeli internet access to begin with. Some analysis suggest attacks against Israel are being conducted by sympathizers abroad, which would make restricting internet access less effective in response. For more about these recent cyber developments underpinning the ground and air game in the Gaza Strip, head over the Bloomberg. 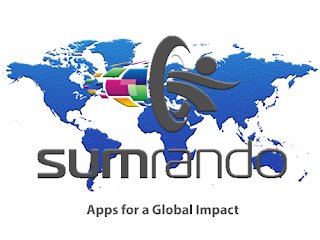 Be the First to Use SumRando Messenger! You send texts and other private message because what you're sharing with someone shouldn't concern anyone else. If you wanted to share your thoughts with the world at large, you could post a Facebook status or tweet your thoughts for the public to read. Unfortunately, your private messages can be vulnerable to others' interference without a secure messenger service. Our new secure SumRando Messenger (Beta) is here to solve that problem. 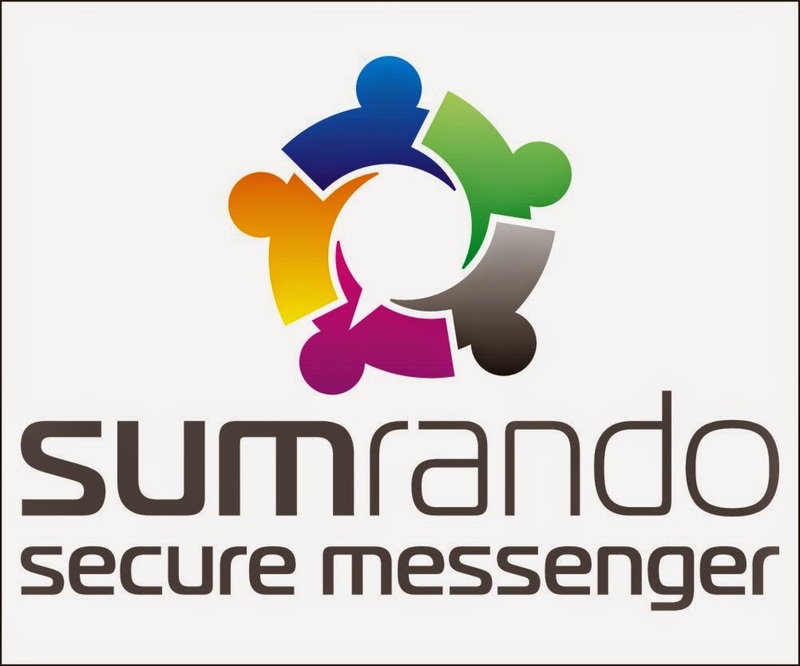 SumRando Messenger (Beta) is a secure, real-time chat app that encrypts your digital messaging from your mobile device. With SumRando Messenger (Beta) you can chat freely with your friends without worry of your ISP, phone provider or government reading along ultimately freeing you from data misuse. We recognize how omnipresent text-based messaging is users, and we have built a new app to help protect the information that was intended to be and remain private. 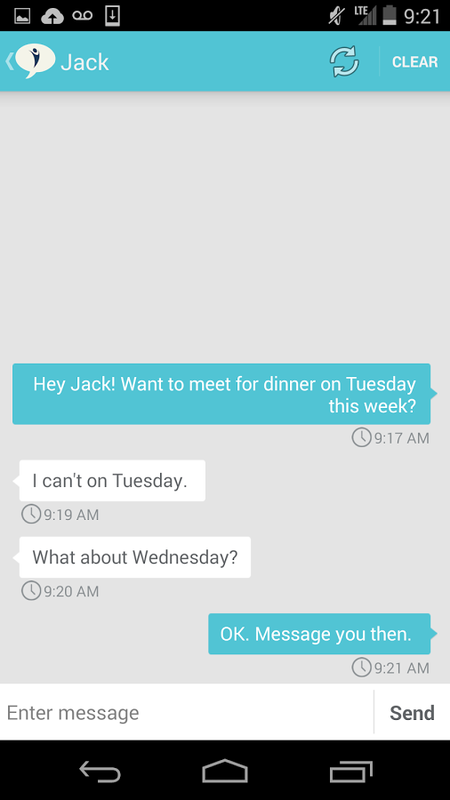 Your email and text invitations to your contacts stay between you and them. 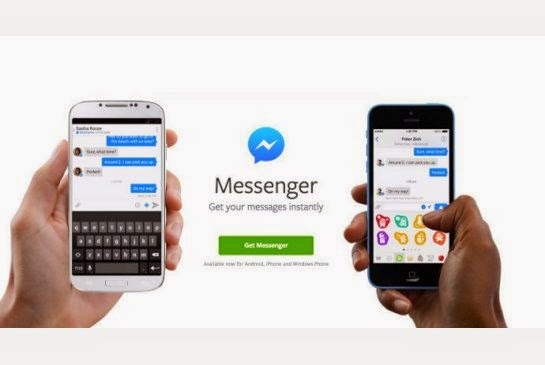 SumRando Messenger does not interfere in this communication. With our messenger app, all your messages and saved friend lists are encrypted, unlike other popular messaging apps. No messages travel from phone to phone; they move through a secure SSL (Secure Sockets Layer) connection to our servers, where they're encrypted. 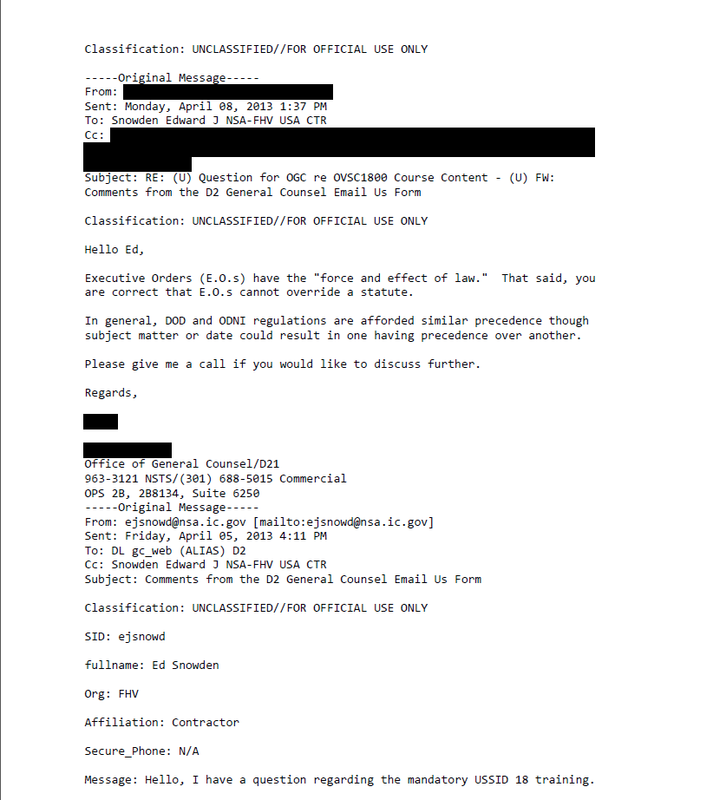 The messages are then sent to the destination phone using Google's Cloud Messaging Service. No one can see to whom you are sending data, not even Google, because of its encryption through our SumRando servers. Getting Started with Sumrando Messenger (Beta) is Easy. 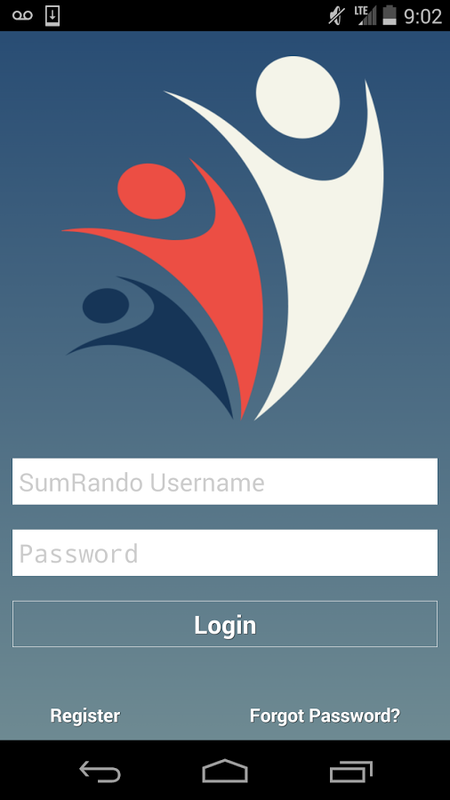 Log in to your SumRando account or start an account, if you were not previously a member. You and your contacts communicate through SumRando, which means you do not have to share your email address or phone number with anyone you're messaging. Invite your friends to download SumRando Messenger. Test out the app with your friends (still currently in beta. Download SumRando Messenger (beta) Now! In the UK, Renewed Interest in a "Snooper's Charter"
The Guardian reports that the UK government is considering measures requiring phone companies to retain detailed records about phone calls, text messages, and internet activity in response to new threats to national security. This latest effort follows a failed attempt at similar legislation last year (dubbed the "snooper's charter" by opponents), when the Labour Party and Liberal Democrats banded with outside groups to defeat the efforts. UK Home Secretary Theresa May, a chief proponent of the law last year, insists that these measures are essential in the face of new threats by groups like al-Qaeda and ISIS. "Any new 'snooper's charter' bill would require a vast extension of the communications data that the phone and internet companies are currently required to retain. It would mean the retention of all data tracking everyone's use of the internet and mobile phones, including every web page visited, and not just the bare details kept for billing purposes by the companies." The UK government has launched an effort to generate support for the emergency measures, emphasizing the harm the government is seeking to prevent. The UK Home Office shared their official stance on the matter with The Guardian, saying, "The retention of communications data is absolutely fundamental to ensure law enforcement have the powers they need to investigate crime, protect the public and ensure national security." The government feels especially pressured to act given that, in April, the European court of justice (ECJ) ruled against surveillience programs put into effect in 2009, saying that it was "too sweeping." The Guardian reports, "The government appears to have secured support from Labour and the Lib Dems to reinstate the surveillance laws after the ECJ struck them down. But the Lib Dems are insisting that the plan will not amount to the reintroduction of the so-called 'snooper's charter' – the communications data bill – that split the coalition and was ditched in 2013." Essentially, the government is pushing for efforts less invasive than those implemented in the past and those proposed last year. While the details that distinguish this plan from the others are important in evaluating the plans, there seems to be concerning support for programs premised on the idea that greater surveillance amounts to greater security. Where exactly is that "line in the sand" previous "snooper's charter" opponents drew as it relates to this latest effort? What about shorter timeframes of record-keeping really makes this acceptable? Read more about the UK government's latest effort at The Guardian. Creators of US-based messaging app FireChat report they have seen an increase of over 40,000 downloads in Iraq in June, when the Iraq government blocked access to internet to slow militant group ISIL (also referred to as "ISIS"). The app uses chatrooms to share messages in areas with poor internet coverage (e.g., airplane and underground train operators) building upon phone-to-phone connectivity. Given the increase in Iraq-based users, almost a tenth of the app's active chat rooms are facilitated by users in Iraq. Financial Times describes the app's technology as well-suited for a situation like that in Iraq. "FireChat, developed by start-up Open Garden, allows access to messaging where getting on the internet is difficult, most prominently where governments are trying to control dissent by forcing people offline. "The app features 'mesh networking' technology that uses Bluetooth to send messages from smartphone to smartphone, leapfrogging over other FireChat users’ phones to extend the distances that chats can travel. If one user is connected to the internet, everyone in the vicinity can also use that connection to browse. Internet users in Iraq are using other means to access the internet in addition to FireChat, including social media networks targeted with the blockage, which continues a trend of users seeking refuge in services that circumvent government-sanctioned internet blockages. Apps like FireChat and services like SumRando help users in these situations access the internet services they need and without detection. In times like these, users recognize the value of having safe, accessible products to rely on when the government overrides their freedom to browse the internet freely. To read more about the blockage, check out our blog on the topic. To read more about FireChat's uptick in Iraq membership, head to Financial Times. You might not think the SumRando blog would be the ultimate source for high fashion. For the most part, you would be right. We wanted to share an interesting story about a concept related to wearable technology. It's no secret that people are betting that a boom of wearable technology such as Google Glass is inevitable. Wired Magazine recently did a cover story on the topic, and there are hosts of new startups looking to revolutionize technology on your body. A new concept out of Vienna suggests wearable technology might start to be reflecting the diversity of potential consumers as it relates to privacy. Just as some prefer slacks to jeans, wearable technology fashion could accommodate those who want to be more connected to others and those who want to remain undetectable. Fast Company reports on a new "invisibility cloak for the digital age" out of Vienna. They share, "Vienna-based architectural design firm Coop Himmelblau has come up with a CHBL Jammer Coat that lets you disappear, sort of. Unlike wearable tech like Google Glass, meant to better connect you to the world, the Jammer Coat makes you utterly untrackable." 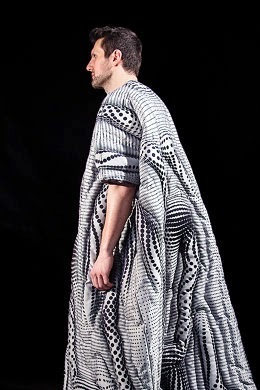 "The CHBL Jammer Coat is a piece of clothing that enables its user to disappear: Google cannot find you anymore. The piece is made of metallized fabrics, which are blocking radio waves and shielding the wearer against tracking devices. You are no longer reachable on your mobile phone and no information from your credit card can be captured. The Wave Circle pattern of the fabric gives an illusion of strange multiple body parts, which hides and frees the individual physicality." The Jammer Coat highlights an interesting parallel between transportable technology and wearable technology: The spectrum of privacy needs/desires and people's action's to carry out those desires. Fashion in many ways acts as an interesting metaphor for people's preferences when it comes to the internet. Certain services and routines are trendy ("fashionable"), which is why users will often go to great lengths -- or be willing to sacrifice a great deal -- in order to remain in step with the latest service. Others are more selective about what technology they trust and use, amassing a set of tools and apps that seem attractive to like-minded people. The Jammer Coat would shroud your devices from detection. 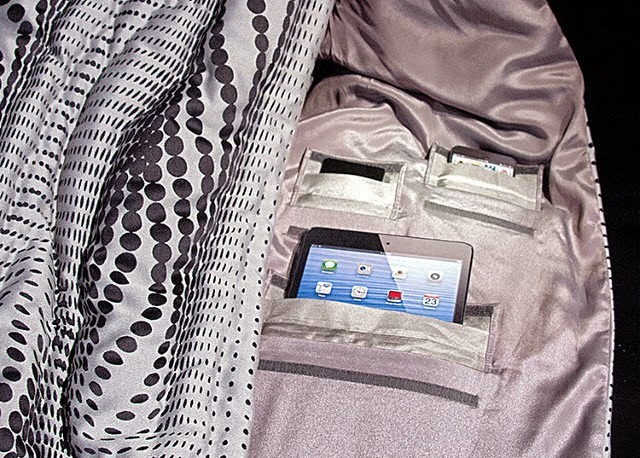 Jammer Coat is important because of the impending growth in wearable technology. Just as good art and design should, Jammer Coat pushes us to examine or re-examine our contexts and the ways in which we view the world. This piece might suggest to some that those of us concerned about privacy advocate for more Jammer Coats (though more colorful and more flattering) at the advent of widespread consumption of wearable technology. What if by doing so we suggest a lack of privacy options is a wearable technology fashion faux pas? The fear of your data being exposed is as real as the fear you've mismatched your outfit at work -- or, more fittingly -- left a zipper open. Unfortunately, there are millions of "zippers down" today and too little messaging that leaving one's zipper down is not just a faux pas but a potentially destructive and dangerous mistake. Is Iraq Gov’t Wrong to Block Access to Internet Amid Turmoil? Mashable reports that the Iraq Ministry of Communications is actively blocking access to social media sites as militant groups like ISIL are using these sites to organize themselves. Users have reported service blockages and the emergence of malware-infected VPNs advertised as ways to circumvent the government’s internet blockage. The Ministry’s actions highlight a key question related to internet freedom: Does your stance change when the shoe is on the other foot? In any situation where the government limits access to the internet, we could be universally opposed to any such action in that all people, regardless of their political affiliation or agenda, should have access to the internet in order to communicate and organize. Supporting internet freedom universally is to adopt a “come what may” mentality about its potential. It’s even easier if we do not believe those targeted are inherently bad actors or we believe the reason behind the action is flawed. With Iraq, where the government seems to be directly censoring a potentially dangerous group (and indirectly censoring the larger public), our universal convictions might be called into question. Mine are. I recognize that once we start to support the suppression of certain groups’ ability to use the internet, quickly we become submerged in ethical quicksand. 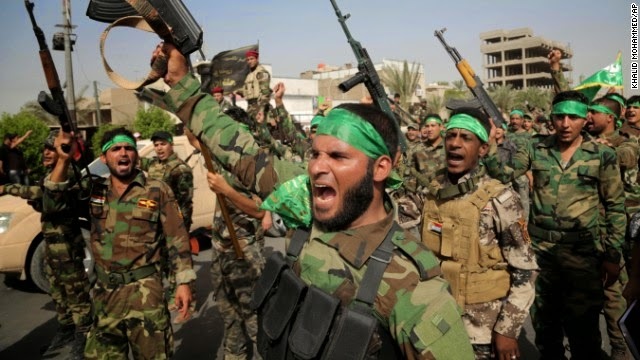 I find myself fighting against the pull of that quicksand when it comes to a militant/terrorist groups like those the Iraqi government seems to be targeting with their blockage. Where I felt the Turkish Prime Minister Tayyip Erdogan acted far beyond his authority and arrogantly suppressed the voices of his dissenters this spring (and previously), I wonder now not if the Iraqi government’s actions had sufficient cause but rather if their actions in blocking the internet were the most effective means to stymie dangerous forces. As someone deeply committed to open access, I feel somewhat unsettled to even entertain supporting a government for limiting access to the internet at all, even for security. Erdogan’s supporters should rightfully push back on my logic since I’m exhibiting less than universal support for internet freedom or, as I’m thinking of it, an appetite for certain exceptions. Admittedly, this appetite for exceptions is linked to security. Erdogan would likely claim, even emphatically, his actions were in the name of security, meant to protect the Turkish people against the harm the internet and social media in particular can bring to the masses. Unlike Erdogan’s crusade, which rallied against social media’s internet danger separate from specific actors, the Iraqi government’s decision to limit access to militant groups promoting propaganda (while still not clearly the most effective means to achieve this result) is different. Where Erdogan’s actions were ideological, it’s possible the Iraqi government’s are far more situational. Regardless of how we feel about targeted action taken by the Iraqi government, we must also recognize the larger implications of such action. Just as the government is limiting this group’s ability to communicate and organize, they are limiting that of millions of other people. The emergence of potentially compromised/unsafe VPNs and other circumventing tools are putting many at risk, at the hands of those the government initially targeted or other malicious actors and groups. This is why I question whether the government’s actions were the most reasonable and effective to achieve their desired goals. Should a government ever take actions like these, and under which circumstances? Given what we know about the current situation in Iraq, did the Ministry of Communications make the right move? The EMC Privacy Index released a study that "examines privacy perceptions of consumers around the world and creates a ranking of nations." The 2014 study "surveyed 15,000 people in 15 countries to produce a ranking of nations based on consumer perceptions and attitudes about data privacy, and their willingness to trade privacy for greater convenience and benefits online." One of the most interesting takeaways from the study is that consumer desires and expectations are often in conflict when it comes to internet privacy. Without widespread adoption of privacy protections for consumers by large, industry-leading companies and with the continued development of government surveillance programs that infringe on users' privacy, the burden to ensure one's privacy often stands squarely on the shoulders of individual internet users. In this environment, our users at SumRando VPN are actively taking control of their privacy with our easy-to-use and reliable solution for protected, undetectable browsing. Even reading blog posts like this one is a step towards becoming someone who takes additional steps to protect themselves online rather rely on industry and government to protect your privacy interests. The 2014 EMC Privacy Index suggests that this type of individual initiative of our users is not the standard among internet users. A majority of internet users (62%) do not take even basic steps such as changing their passwords regularly to protect their privacy online, while around half of internet users have experienced a data breach (email, mobile device, social media, etc.). 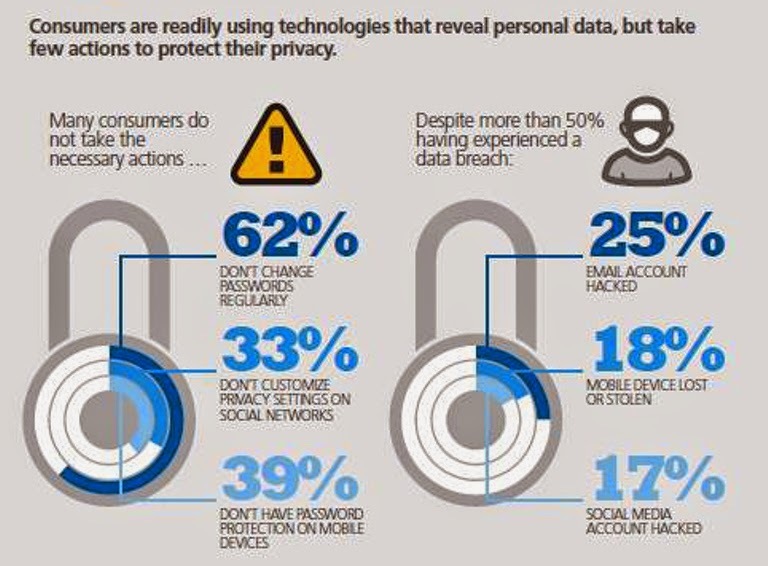 Users report low rates of privacy protection activities, suggesting the importance of passive privacy protections for users. The index breaks down data based on users' various personas (at work, as consumer, as social media user, etc.) in full text or easy-to-digest infographics that additionally suggest we as users act differently given the task at hand or persona we embody. Read more about the study's findings at the 2014 EMC Privacy Index website or read the Executive Summary they have posted. Let us know what you think in the comments below. Can Google's New End-to-End Push Industry Standards Forward? Last week, when we supported the #ResetTheNet campaign, we provided our Gold VPN free for a month to encourage as many users as possible to start using a VPN or allow them to upgrade to one that was faster and more helpful. The intent behind the RTN campaign was to encourage individuals to take action to protect themselves, but another main goal of the campaign was to encourage companies (like us) to help “reset” the complacency and lack of knowledge that characterizes internet privacy issues en masse. Privacy experts like ACLU’s Ben Wizner have observed that while individual action can curb the harmful effects of invasive practices, it is industry that needs to take the lead on these matters. Last week, Google participated in RTN with SumRando and other companies by unveiling a new solution that could help their users better encrypt their data. Google has been the target of extensive criticism the past several years, but their new “End to End” Chrome extension seeks to make encryption easier for a larger group of users. Given its size and market share, Google could help inspire other companies to follow suit. Google's encryption software is not yet ready for mainstream use. The company is offering it as alpha code so it can be tested. Those who find bugs in the code can submit them for a possible reward through the company's Vulnerability Reward Program. When End-to-End is ready to be released, Google plans to offer it through its Chrome Web Store as a Chrome browser extension. End-to-End is based on OpenPGP, an open protocol for encrypting messages through public key cryptography. Google's embrace of encryption will have a downside for the company: Messages encrypted on Google's servers cannot be scanned, eliminating their use as a source of ad-targeting data. However, given how much Google already knows about its users and the fact that it expects only the security-conscious minority to install its encryption software, the company's ability to target ads isn't likely to be much degraded. 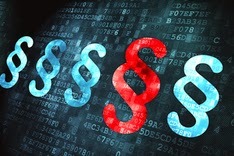 Read more about Google’s new encryption solution at Information Week or Google's code hub. Today is the day to #ResetTheNet, where internet users across the world take strong steps to ensure their privacy and security -- and those of others. Companies like SumRando VPN are running specials, launching new products, and making public statements in support of increased privacy and against mass surveillance. 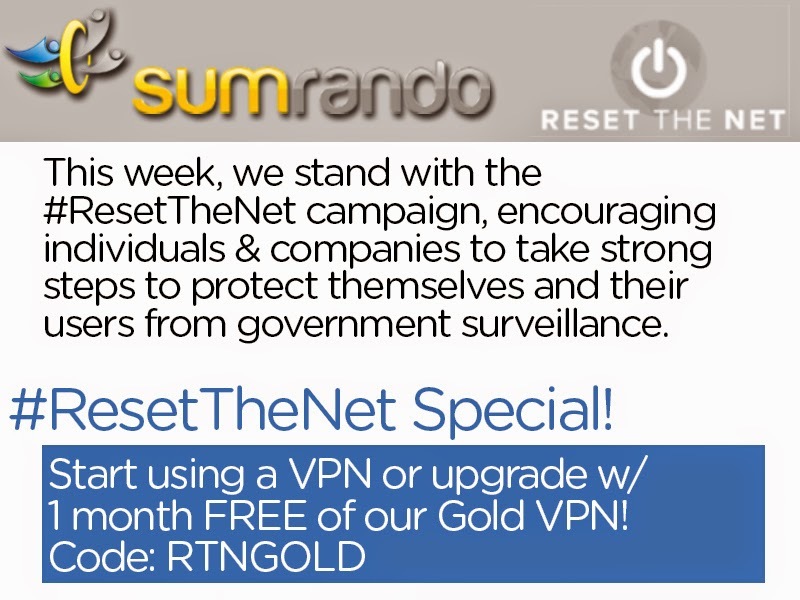 In honor of #ResetTheNet, you can sign up for our Gold VPN for 1 month FREE. If you aren't using a VPN currently or you want to upgrade to our premium account, use the code RTNGOLD on our site. Learn more about today's activities by checking out ResetTheNet.org.